Are you experiencing issues with your air conditioning system? Is your furnace not meeting its demands? Perhaps it’s time for a professional solution. 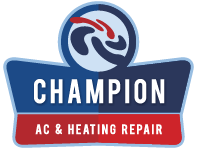 Contact the experts at Champion AC & Heating Repair and schedule one of our technicians to diagnose the problem. Please fill out the form or contact us by phone. You will be relieved you did.